Is there a list of things you should do after getting a 1500? I know that there are a lot of DIY helps, and these are great. But, I am wondering if there is a list of things that a new owner should Adjust, replace, fit, remove, etc. after getting a new to them 1500. Some things I know are timing belts, sub filter, cruise filter, air filter, the normal fluid changes, etc. But what about those other things? Cable adjustments? Switch maintenance? I owned another brand of bike and there was a whole list of things that new owners should do to make sure it is ready for a riding season, things the dealer does not do, or wisdom learned from old sage 1500 riders. Once the weather turns bad, hopefully not till late Dec. I will be putting the bike in the shed to pull it apart and do all these needed updates/repairs. Re: Is there a list of things you should do after getting a 1500? this is not the list I am thinking of, but the posts do a good job. Does the Cruise Control lock in at the speed you set it? if not, adjust the cables on the right side of the carbs. 1500 cruise adjustment is on the left side. Someone did an in-depth tutorial on here, easy to do. I am of the school if it ain't broke don't fix it. but..besides the things you listed..check the forks for leaks, replace the brake fluid front and rear, rear gear oil too. check the brake pads and rotors, steering head check for smooth operation, lube all the cables. Bought my '95 SE CDN Edition in July and I'm enjoying the ride immensely while I have my '85 LTD apart for a valve job and other maintenance issues. Came up with a list similar to yours. Timing belts, plugs, fluid change - clutch/brakes/coolant, filters all round. rebuilt the front forks - new bushings and seals - change oil - probably hasn't been done in a while, pulled back end off to lube the splines, new brake pads - gives you peace of mind, replaced the suspension as it probably is quite soft and worn out - Progressive fork springs and 416 series air shocks - consider suspension not only for quality of ride and bike performance, but a safety issue. Having done this, I ride the bike with confidence knowing it is safe for the road. You don't have to do the suspension but it will make a difference. Probably do this minimum maintenance/work and be in it for less than $1000.00 USD. Switches I'd leave alone until necessary. Most get better with use. Bought a HO alternator for install next spring - will install new rubber dampers at alt install. Other items for next spring are new tires, wheel and steering stem bearings, and rear wheel rubber dampers. Once this last bit of maintenance is done in the spring, bike will just be on the road and used. Have a bit of an idle "hunt" when stopped. Not too worried as long as it does not get worse. On the list for when the 1200 gets back on the road. Agree with RBGERSON, if it ain't broke don't fix it, but do the required maintenance work for personal and bike safety. Learned from my '85 LTD that I have kept a record of the costs. Easy to rack up the costs just because. My 1500 is on the road for just over $1500.00 CDN in parts and maintenance - not including the cost of purchase, and the most expensive parts were the suspension upgrade at $750.00 CDN. I have always had the motto " Don't fix what ain't broke "
therefore, my annual PMs are a bare minimum. so far, it has served me well. I get the "if it ain't broke..." but I do need to trust the bike. 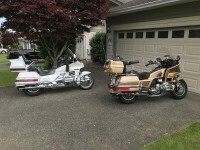 This next week I am either riding 250 miles each way or 311 miles each way for work and I am using the 1500. My truck gets 9 MPG, I just can't afford to drive that unless I really need to. So, I really need to get the bike in the shop and go through it so I am happy with it. And I need to fix this Gawd Awful suspension. I just sat down and quickly compiled a list of things to check. I'm sure there are more but this is what I came up for now. 1. Replace Engine Oil and Filter. 2. Replace Final Drive Gear Oil. 3. Flush Rear Brake Master Cylinder, Rear Caliper and Left Front Caliper with new DOT 4 Fluid. 4. Flush Front Brake Master Cylinder and Right Front Brake Caliper with new DOT 4 Fluid. 5. Flush Clutch Master Cylinder and Slave cylinder with new DOT 4 Fluid. 6. Check Forks of leakage. Check fork tubes for signs of wear. 7. Check rear shocks/load leveler for signs of leakage. 8. Flush cooling system with Distilled Water. Refill with Phosphate and Silicate Free Coolant. 9. Check battery with V.O.M. to insure 12.7 volts with Ignition off. 10. Start bike while monitoring battery voltage. Should not drop below 10 volts. 11. Check charging system to insure at least 13.5 volts while running above idle. 12. Check running lights, turn signals, brake lights and headlights for proper operation. 13. Check Gauges and Warning Lights for proper operation. 14. Check Reverse for proper operation if so equipped. 15. Check AM/FM and CB radio switches for proper operation. 16. Check Tire age. Look for the manufacture date on the side wall. Should not be older than 10 years. 17. Check Tire tread. Should have 3/32" tread or more. 18. Check Tire Pressure. Minimum of 38 psi front / 41 psi rear. 19. Change timing belts if over 10 years old. Inspect Timing Belt idler bearings for smooth operation. 20. When time permits, remove the fairing parts and replace the Cruise Air Filter and Sub Filter. There are many other items I am sure, but this should keep you busy for a while. I purchased a 95 GL1500 Se for $1000. We replaced the battery and was able to start the bike, we shifted the transmission while on the center stand... but when it came time for the test ride we found the clutch wouldn’t work.. ok.. I trailered it home and should have the clutch master and slave rebuilt inside of a hour.. then test ride! So disappointed... I am seriously jonesing for a chance to ride it. So this last weekend I rebuilt the petcock, and replaced the main air filter and the fuel filter. This solved the gas leak from the petcock, and the bike runs a bit smoother...on its stand. The master clutch rebuild kit did not arrive as promised and was supposed to have been in back order status... Saturday was a great day for a last ( or first) ride. Fixed the clutch rebuild and the bike rode like a champ finished and got a ride in before the weather started getting seriously cold.